The following article was published on the Haiti blog of Rabble.ca. It also appears in the July 4 issue of Haiti Liberté newsweekly. The plight of some 400,000 Haitians still living under tarps and tents since the Jan. 12, 2010 earthquake has surged into the streets and headlines in recent weeks, highlighting one of Haiti’s most explosive and intractable issues. 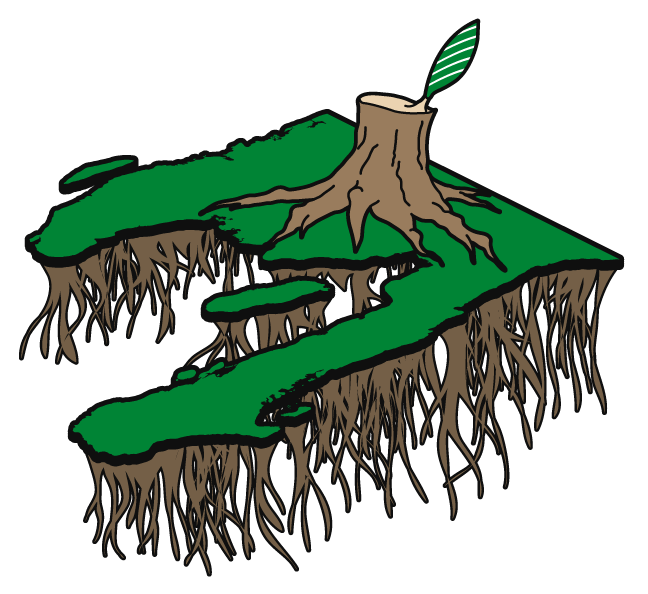 A new grassroots campaign, an international petition, several new reports, and street demonstrations are underscoring the problem’s urgency. On May 31, dozens of protesters mobilized by the Forces for Reflection and Action on Housing Matters (FRAKKA) demonstrated in front of the office of Prime Minister Laurent Lamothe to denounce the broken promises of Haitian government officials to provide housing for earthquake victims. “We in FRAKKA have noted the growing speed of forced expulsions against the displaced people camps,” said Rénel Sanon, FRAKKA’s Secretary General. For almost one year now, the government of President Michel Martelly has trumpeted a program entitled ‘16/6’ under which about 30,000 residents of six large camps would be resettled to their original but repaired 16 neighborhoods, all of which were badly damaged by the quake. The program has been heavily supported by foreign governments, including Canada. To encourage people to leave camps, residents were told they will receive a one-year rental subsidy of $500 per family. 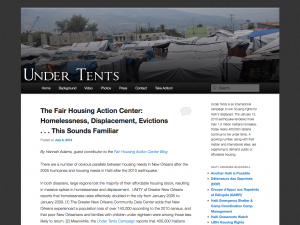 On July 2, Haitian grassroots organizations, including FRAKKA, and their international allies launched a housing rights campaign called ‘Under Tents’. It is demanding permanent housing solutions for the hundreds of thousands still living in displacement camps around Port-au-Prince. The groups are demanding that the Haitian government immediately halt all forced evictions until public or affordable housing is made available. They call on the government, with support from donor countries, to move quickly to designate land for housing, create one centralized government housing institution to coordinate and implement a social housing plan, and solicit and allocate funding to realize this plan. The “Under Tents” campaign will press for congressional and parliamentary action in the U.S., Canada, and Europe to support the construction of housing for displaced Haitians. The campaign will also raise international awareness about the crisis through news media and solicit support from housing rights organizations around the world. The centerpiece of the campaign is an online petition demanding that “ the Haitian government address Haiti’s epidemic of homelessness.” It is addressed to President Martelly, Prime Minister Laurent Lamothe, U.S. Secretary of State Hillary Clinton, her chief counselor Cheryl Mills, Haitian Senate President Simon Dieuseul Desras, and President Levaillant Louis-Jeune of the Chamber of Deputies of Haiti. 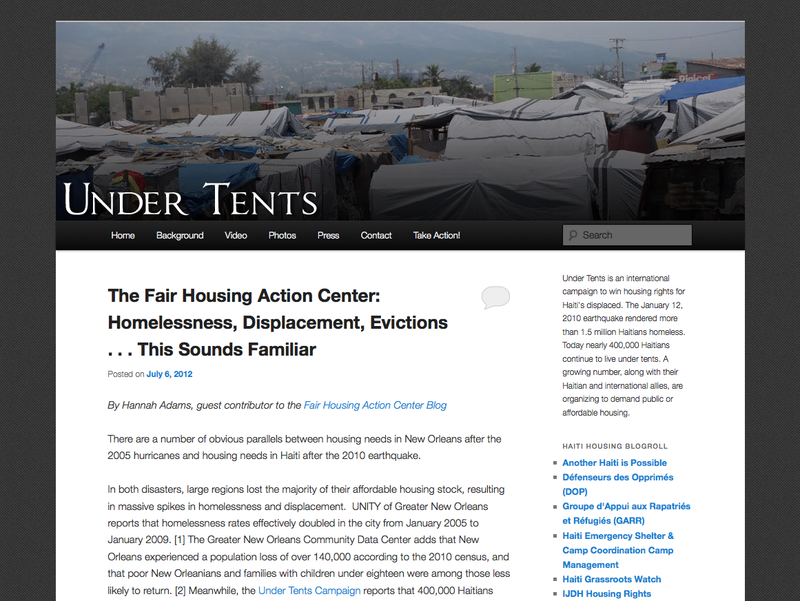 The Under Tents campaign will run through Oct. 1, 2012 (World Habitat Day). It is supported by 14 international organizations, including Chans Altènativ, Grassroots International, Haiti Support Group (UK), the Institute for Justice and Democracy in Haiti (IJDH), Other Worlds, the Quixote Center, TransAfrica, and the Canada Haiti Action Network (CHAN). “We are asking simply for quality homes where people can live,” said FRAKKA’s Jackson Doliscar in announcing the petition and campaign. Several new reports on Haitian housing provide a grim picture of what has and has not been accomplished by international assistance in the two and a half years since the earthquake. A six page report published in June 2012 by the Jesuit-supported, Port-au-Prince-based Center for Research, Reflection, Training, and Social Action (CERFAS) provides some important statistics. It says that on the eve of the earthquake, an estimated 300,000 new lodgings were required in Port au Prince. It notes the 2010 post-quake survey commissioned and directed by Haiti’s Public Works, Transportation and Communication Ministry that showed 20% of the estimated 414,000 dwellings in the capital were damaged beyond repair and another 26% were unsafe, requiring structural repair. The CERFAS report documents that housing “reconstruction” efforts have been directed overwhelmingly to building temporary shelters. It says 109,000 of these ‘t-shelters’ (in NGO parlance) have been erected, compared to 13,000 homes repaired and 5,000 permanent homes built. Temporary shelters have absorbed 79% of the $461 million spent so far on housing. Even now, housing construction is still focused on building temporary shelters, with another 5,000 forecast. CERFAS notes critically that there is nothing “temporary” about the plywood shelters being built; in the absence of house construction, the “temporary” shelters are becoming permanent homes. Having been built to lower standards, they will of course not last long. The report also cites various news reports showing that the beneficiaries of temporary shelters have often not been Haiti’s most needy. Some shelters are being sold, while others have ended up on the rental market. CERFAS laments the choice of temporary over permanent housing, echoing the views of many agencies involved in housing assistance in Haiti. It notes that a permanent dwelling costs only twice that of the plywood shelters, and even this difference could be reduced through economies of scale. CERFAS looks at the ‘16/6’ program of rental subsidy. It notes that while the program provides funding for house repair, the vast majority of people in the camps, as in the city as a whole, are renters. The six targeted camps of ‘16/6’ happen to be in the more well-to-do or conspicuous areas of the city – Place Boyer and Place St. Pierre in Pétionville, Champ de Mars, Carl Brouard, Maïs Gaté/Airport, and the Vincent Gymnasium in Port-au-Prince. The 16/6 beneficiaries amount to about 5 percent of those residing in camps, according to the International Organization for Migration (IOM). Although the plan has already evacuated at least three of the camps, according to the Humanitarian Bulletin for July 2012 of the Office for the Coordination of Humanitarian Affairs of the UN in Haiti (OCHA), refurbishment has begun in only eight of the program’s 16 neighborhoods. According to the IOM, the population in the camps is now just under 400,000. The reduction is attributed to forced removals, rent subsidies, and voluntary departures. The drop in the displaced population is cited by international governments and media, as well as UN officials, as a sign of progress in post-earthquake assistance. But the IOM admits that beyond the 16/6 camps, it “doesn’t know” where the disappeared numbers have gone or if their new conditions are better than camp conditions. Many of the departures no doubt account for the high re-occupation rates of damaged or destroyed houses. Forced relocations remain a threat to displaced persons in the camps, and even people targeted by 16/6 program have been victimized. CERFAS reports that in April 2012, 81,000 camp residents were threatened with eviction. It also cites Article 22 of Haiti’s Constitution which guarantees the right to housing and obliges the Haitian government to ensure it. Shortly following the earthquake, the Haitian government adopted an ‘Action Plan’ for reconstruction, affirming that the “absolute priority…is to respond to the needs of the affected population,” notably with respect to temporary and permanent housing needs. 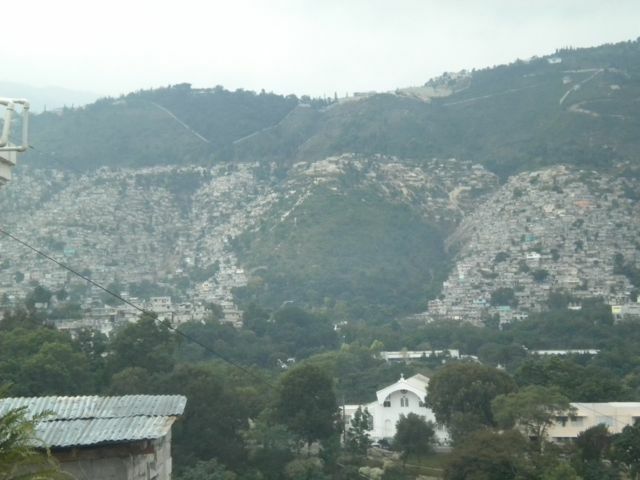 As calls to build housing grow, the government recently announced it would raze about 450 homes in the hillside shantytowns of Jalousie and Canapé Vert in order to prevent more environmental damage to Morne L’Hôpital, the mountain that towers over Port-au-Prince’s south-eastern flank. In compensation, the government is offering family’s losing their home a mere 100,000 gourdes ($2,500). The announcement provoked large anti-Martelly marches through the streets of Pétionville on June 21 and 25. The latter demonstration, which numbered over 2,000 people, marched all the way down to the Champ de Mars public square in front of the National Palace. Housing protests are coinciding with other rising demands. The June 25 rally at Champ de Mars was joined by small merchants from the large, informal market at the Port-au-Prince port which burned to the ground on June 18. Merchants have received no assistance or compensation from the government. Haiti Liberté has also reported that residents in several regions of Haiti, including Cabaret, north of the capital, and Miragoâne and Petit Goâve to the south, staged militant protests in June to demand that local authorities act to improve and stabilize electrical service. Kim Ives is an editor of Haiti Liberté newsweekly in Brooklyn NY. Roger Annis is a coordinator of the Canada Haiti Action Network in Vancouver BC. More background on Haiti’s housing crisis can be found in ‘Haiti’s housing and shelter crisis still looking intractable,’ by Roger Annis, Feb 23, 2012.